Carmelo Anthony and the New York Knicks have had a rough year. The New York Knicks head into Friday night’s matchup against the Boston Celtics having lost two of their last three games, the first being a 41-point torching by Boston. The putrid performances have extended beyond the court for the Knicks, too, with front-office troubles increasing and help hard to find. 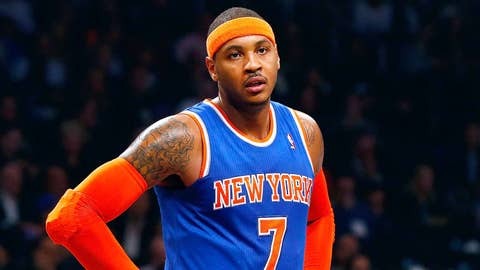 That’s started some rumors that Knicks star Carmelo Anthony is thinking of finding a way out of New York, possibly even before free agency hits. Foot Locker has decided to make good on such a premise, releasing a new video showing what it would take to get Anthony to turn his back on the Knicks. Apparently, some new shoes would do the trick. The ad, which follows the dramatic buildup of Anthony entering an NBA game, shows him ditching Madison Square Garden for the retailer’s 23 Days of Flight promotion. It’s a prospect that Anthony — and maybe Knicks fans — can only dream of at this point.